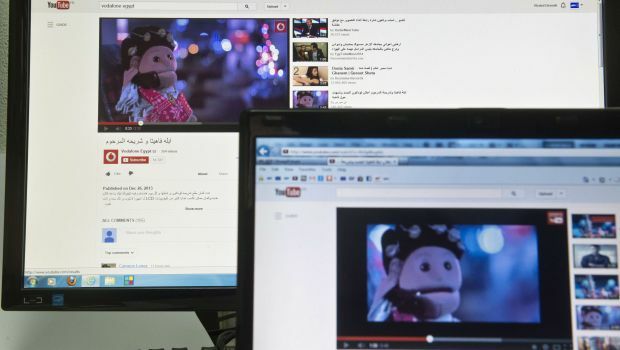 Cairo and London, Asharq Al-Awsat—An online ad for cell phone carrier Vodafone in Egypt featuring well-known puppet Abla (Aunt) Fahita and her daughter, Karkoura, has been accused of sending secret terrorist messages by self-styled youth activist Ahmed Zebider, who filed a complaint with the country’s prosecutor-general. Zebider, who is using an assumed name meant to sound like the English word “spider,” is a pro-Mubarak activist described by Ahram Online as a “wannabe artist and renowned conspiracy theorist.” He claimed that the Vodafone ad, which features puppet Abla Fahita searching for her late husband’s cell phone SIM card, included secret messages regarding a forthcoming attack on a shopping mall. In the ad, the talking puppet confirms to an off-screen character called “Mama Touta” that she has asked building security to acquire a sniffer dog to search for missing things. Speaking on Al-Tahrir TV earlier this week, the youth activist claimed that the mall and dog refer to the planned site of an attack, while “Mama Touta” is a code name for the Muslim Brotherhood, recently designated a terrorist organization by the military-backed interim government. He claimed that a cactus decorated with Christmas baubles was also a secret sign, claiming the four-pronged plant resembles the infamous pro-Mursi Rabaa sign and that a red Christmas ornament was equivalent to a bomb. Spider claimed that Abla Fahita, who became an Egyptian phenomenon in 2013 and who appeared numerous times on Bassem Youssef’s controversial Al-Bernameg program, is suspicious, raising questions about her origin and the timing of her fame. For her part, the puppet Abla Fahita herself appeared on CBC, the channel that hosted Al-Bernameg, via Skype, denying the accusations to host Khairy Ramadan. “The advertisement carries no other meaning and any interpretation other than that is the imagination or personal opinion of some of the audience,” the official Vodafone statement added. The source added that the investigation is a normal procedure after a complaint has been raised, and if the complaint is proven to be frivolous it is rejected, while if it is shown to be serious, it is transferred to the relevant authorities.